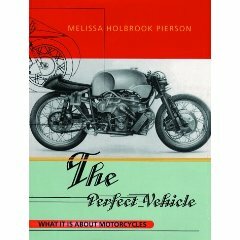 “The Perfect Vehicle – What is it about motorcycles?” by Melissa Holbrook Pierson. I was prepared to love this book, I guess I am prepared to love a lot of things: it’s the story of an overthinking new motorcycle rider just like me. Unfortunately it reads like a combination of an extended airline magazine article and a series of diary entries with all the good bits cut out. The influence of Pierson’s husband, writer Luc Sante, is found in the presence of many historical sidebars about motorcycling, but these lack the narrative flow and focus on personal details that make Sante’s writing so compelling. Piersen prevaricates about her personal life. I appreciate her writing honestly about heartbreaks, but there is little introspection on why things went wrong and what her role was in it, other than that her family was not affectionate . She meets Luc and a sentence later they are married. Often the language she uses sounds overconstructed, phrases like “loath even though I am, to share my toilette with arachnids”. Who talks like this? It’s writing for effect, rather than writing honestly. Pierson does have an important story to tell: “I also worked on trying to make peace with a secret, not too conscious wish to find someone who would take care of my-bike-and-by-extension-me, because I discovered in this a dangerous futility that only served to keep alive in me a pervasive sense of incompetence.”…”I began to sense that my motorcycle was again trying to tell me something, this time something ancient and wise….’Captain your own ship’. Ah thanks.” (p. 182, paperback). That’s the emotional core of the book and it never gets developed. In its place we get pages of reprinted letters from the Moto Guzzi National Owner’s Club News. In the end “The Perfect Vehicle” takes a wrong turn. ← “Where’s Poppa”: When farces plod. > with arachnids”. Who talks like this? its hard to write a book. could u have done a better job, o gr8 1? if u think so, and i’m sure u do, u shud write a book yerself. btw, does she ever call her hog a donor cycle? You’ve done it again. Amazing writing.